Despite the elaborate fantastical plot and multitude of characters, Dungeon Hunter HD is about one thing: killing bad guys. Gameloft's vision of fantasy adventure isn't Shakespeare with swords. Nor is it a grand character exercise with large parties ala the Final Fantasy series. 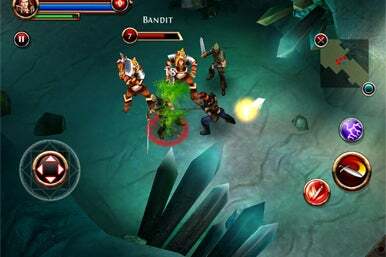 Instead, Gameloft keeps it simple in this hack-and-slash title. Hack, slash, and yes, electrocute. An almost tedious 1 ½ minute video introduces you to the world of Gothicus, where you’re a prince with amnesia who has awoken to find that your kingdom is overrun with dark forces and your former queen is terrorizing the citizenry. As is often the case, when you used dark magc to bring your former queen back from the dead, something went terribly wrong when she woke up and tried to kill you. The formula is familiar to fans of dungeon crawlers despite all of the bells and whistles the game includes. The game progresses through a series of maps, where your goal is to acquire as much gold, weaponry, and armor as possible while killing off bandits, thugs, and even some really big arachnids. It’s easy to lose track of the story line, but regular interludes and onscreen prompts help remind the player of what’s going on. Every couple of levels, you’re taken to a village where you can visit a merchant, who will sell you supplies for gold as well as buy your extra supplies off of you. One of the best things to stock up on is potions, as these will help reload your strength mid-battle to keep you from dying off and starting a level all over again. If you’re out of potions, just idle a bit and your health bars will fill up by themselves over time. A touch-screen joystick navigates the maps, while multiple buttons allow you to strike, block, and otherwise attack enemies. The main button is usually a sword, but occasionally changes pictures to represent the task at hand (opening a chest, unlocking a gate). The user profile is almost comically detailed, with statistics on all of the offensive and defensive moves you’d used, an inventory of the supplies you’ve picked up, 15 unlockable skills, profiles of the fairies protecting you, and then a list of missions you’ve completed as well as the one you’re working on. You can also use acquired points to increase strength, dexterity, endurance and energy. The controls are sensitive for the most part, but once in a while it would take a disproportionate amount of force to really propel the character in one direction. Also, when fighting it was sometimes difficult to tell whether I was close enough to an enemy to actually hit him. Quite often I would swing and miss an enemy even though I was right up against him. Dungeon Hunter does look great, though. The graphics are crisp and pleasantly reminiscent of the Legend of Zelda games, with medieval backdrops full of castles and knaves and fairies. Despite the repetitive hack and slash formula set in a seemingly never-ending array of dungeons, there are little details that speak to a deeper, more role playing game experience. It's not often you find a game on the iPad where you can spend hours leveling up your character and buying/selling loot. For $7, Dungeon Hunter HD is definitely a good investment for any fan of fantasy games.